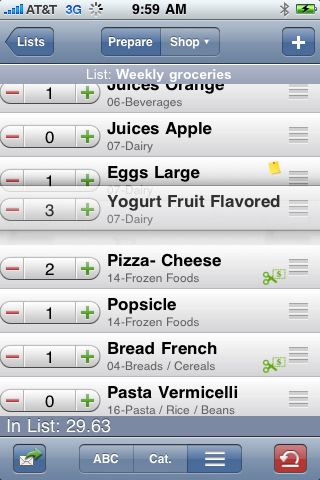 Grocery Gadget is an iPhone Grocery List app that lets you share & sync lists w/ other iPhones, iPod Touch devices and desktops. Its sync technology (similar to MobileMe) lets you use the same info. For example you can make a grocery shopping list and share it with your significant other and have them go purchase the item you need. No more calling them on the phone and them forgetting something the last minute. A little bit live the TiVo setup, the Grocery Gadget iPhone app learns the order of items at the store as you shop and check them off your list. Next time you shop the items are in the proper order. You can also name the categories in each list with the aisle numbers at that store. And to top it off, you can even just scan bar codes to quickly get items added to your lists. Finally you can now import recipe ingredients from popular softwares including BigOven and HandyCookBook, and import from other applications such as CSV, Grocery iQ, Shopper, Groceries, and more to come. AppSafari review of Grocery Gadget was written by Joe Seifi on March 31st, 2009 and categorized under App Store, Featured, Notes, Shopping, Utilities. Page viewed 8911 times, 1 so far today. Need help on using these apps? Please read the Help Page. My wife and I have used this app for months, both on our iPhones and the Grocery Gadget website. We’ve never been more efficient or cost effective when grocery shopping in our lives.